James Collins headed a late winner as Aston Villa recorded their first home win since August with a dramatic victory over a much-changed Blackpool. Stuart Downing put Villa ahead with a volley that deflected beyond Richard Kingson but Marlon Harewood levelled with a side-foot shot before the break. Nathan Delfouneso volleyed Villa ahead again but Blackpool equalised when a DJ Campbell shot deflected in off Collins. The defender made amends minutes later when he headed in from a corner. The goal came as a cruel blow to a Blackpool side that featured 10 changes from the team that drew 2-2 against Everton on Saturday. Six of those players, including skipper Jason Euell, were making their first Premier League starts this term. Given that the Seasiders arrived at Villa Park in the best away form of any team in the top flight, the wholesale change seemed a curious move from Blackpool boss Ian Holloway. And yet it was the visitors who made the livelier start, Villa old-boy Harewood spurning two early chances to score on his first return to Villa Park. Ghana international goalkeeper Kingson was not idle at the other end, though, as Villa youngsters Marc Albrighton and Ciaran Clark both tested the Seasiders' keeper early on. But Kingson could not deny Downing after the Villa midfielder exchanged passes with Ashley Young before unleashing a vicious volley that took a deflection off defender Rob Edwards and flew into the visitors' net. The goal galvanised the home side and midfielder Albrighton almost made it 2-0 with a half-volley from close range but Kingson palmed the ball away. Yet Blackpool had begun to gel despite the changes and the visitors showed they did not intend to give up their fine away record without a fight. On the stroke of half-time, Harewood equalised after collecting a delicate backheel from the excellent Matt Phillips before settling himself and planting the ball into the far corner on the stroke of half-time. Villa came out all guns blazing after the break and Blackpool were lucky to survive two early tests as Ashley Young tested Kingson with a well-struck volley and Collins headed goalward only to see his effort cleared off the line by David Carney. Delfouneso looked to have broken the deadlock when he outmuscled Dekel Keinan to head home but he was adjudged to have fouled the Blackpool man by referee Anthony Taylor and the goal was not given. The teenager was not to be denied though and after latching on to a lovely through ball from Ashley Young, Delfouneso slotted beyond Kingson on the hour. 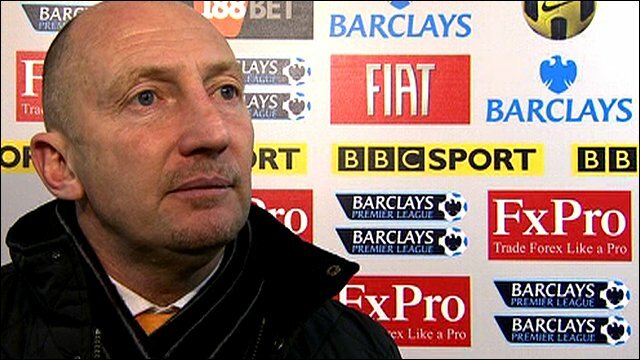 Blackpool were reeling but manager Holloway refreshed the side as he threw leading scorer Charlie Adam and Campbell into the fray. The substitution proved inspired, striker Campbell wriggling beyond a panicking Villa defence to unleash a volley that flew in off Collins with only three minutes remaining. Villa could see their chances of a first win in five matches slipping away from them as Blackpool looked to have salvaged a point. But neither side was prepared to settle for a draw and as they pressed for the winner it was Collins who popped up with the deciding move, rising to head home from a corner with a minute to play. "We were a bit anxious, a bit nervous because we needed the points. "The first-half I would say was dreadful but the second-half we were better. "We took more responsibility to attack, created more chances and played a more exciting game." "To make 10 changes might have looked crazy. We've got four games in 12 days and the lads I've played every week are struggling to keep up the level. "That was a test for us and our strength in depth and a test for the ones who haven't played and I'm bursting with pride because they were fantastic. "I felt their performance more than at least deserved a point. The whole club has been represented magnificently." 90:00+4:21 The referee blows his whistle to end the game. 90:00+3:30 The ball is delivered by Matt Phillips, Header from close range by Dudley Campbell misses to the right of the target. 90:00+2:18 Substitution Eric Lichaj is brought on as a substitute for Barry Bannan. 90:00+0:24 Ciaran Clark concedes a free kick for a foul on Keith Southern. Charlie Adam restarts play with the free kick. 90:00+0:10 Ashley Young is flagged offside by the assistant referee. Richard Kingson restarts play with the free kick. 88:12 Inswinging corner taken by Stewart Downing, Stewart Downing provided the assist for the goal. 88:12 GOAL - James Collins:Aston Villa 3 - 2 Blackpool James Collins fires in a goal from inside the area to the bottom left corner of the goal. Aston Villa 3-2 Blackpool. 87:47 Centre by Ashley Young, clearance by Rob Edwards. 86:19 GOAL - Dudley Campbell:Aston Villa 2 - 2 Blackpool Dudley Campbell gets on the score sheet with a goal from outside the box to the top left corner of the goal. Aston Villa 2-2 Blackpool. 85:23 Chris Basham concedes a free kick for a foul on Gabriel Agbonlahor. Free kick taken by Stephen Warnock. 84:47 The referee blows for offside against Stewart Downing. Indirect free kick taken by Rob Edwards. 82:17 Effort on goal by Ashley Young from long distance goes over the crossbar. 81:59 Stewart Downing delivers the ball, Rob Edwards manages to make a clearance. 80:19 Substitution Marc Albrighton leaves the field to be replaced by Stephen Ireland. 80:01 The ball is sent over by Stewart Downing, Shot by Marc Albrighton from inside the six-yard box clear the bar. 79:24 Inswinging corner taken left-footed by Charlie Adam played to the near post, clearance by Stephen Warnock. 76:52 Substitution Dudley Campbell on for Marlon Harewood. 76:32 Marc Albrighton produces a left-footed shot from just outside the penalty box that goes wide left of the target. 75:27 Corner taken by Ludovic Sylvestre from the left by-line, Header from close range by Rob Edwards misses to the right of the goal. 75:04 Corner taken left-footed by Charlie Adam, James Collins makes a clearance. 74:24 Foul by Stephen Warnock on Matt Phillips, free kick awarded. Shot on goal comes in from Charlie Adam from the free kick, blocked by Ciaran Clark. 74:24 Booking Caution for Stephen Warnock. 74:06 Substitution Ian Evatt is brought on as a substitute for Dekel Keinan. 73:28 Stewart Downing takes a shot. David Carney gets a block in. 70:12 Jason Euell challenges Ashley Young unfairly and gives away a free kick. Stewart Downing has an effort direct from the free kick, save made by Richard Kingson. 70:12 Substitution Charlie Adam joins the action as a substitute, replacing Jason Euell. 70:12 Booking Jason Euell goes into the referee's book. 69:35 Stewart Downing sends in a cross, clearance by Rob Edwards. 68:10 Effort from deep inside the area by Stewart Downing misses to the right of the goal. 66:09 Gabriel Agbonlahor is adjudged to have handled the ball. Direct free kick taken by Ludovic Sylvestre. 65:12 Free kick awarded for an unfair challenge on Stephen Warnock by Chris Basham. Stephen Warnock restarts play with the free kick. 65:12 Booking Booking for Chris Basham for unsporting behaviour. 63:24 Substitution Gabriel Agbonlahor joins the action as a substitute, replacing Nathan Delfouneso. 62:56 Stewart Downing takes a shot. Richard Kingson makes a save. 62:01 Corner from the left by-line taken by Stewart Downing, clearance by Dekel Keinan. 59:27 Ashley Young provided the assist for the goal. 59:27 GOAL - Nathan Delfouneso:Aston Villa 2 - 1 Blackpool A goal is scored by Nathan Delfouneso from inside the box to the bottom left corner of the goal. Aston Villa 2-1 Blackpool. 57:34 The ball is sent over by Marc Albrighton. 57:14 Marc Albrighton crosses the ball, Keith Southern manages to make a clearance. 56:33 Outswinging corner taken by Stewart Downing, clearance made by Rob Edwards. 54:55 Nathan Delfouneso challenges Dekel Keinan unfairly and gives away a free kick. Direct free kick taken by Richard Kingson. 52:52 Corner taken by Stewart Downing, Header from deep inside the area by Richard Dunne goes harmlessly over the crossbar. 52:14 Corner taken by Stewart Downing from the right by-line. 51:41 Inswinging corner taken from the right by-line by Stewart Downing. 47:30 James Collins takes a shot. Save by Richard Kingson. 46:12 Ashley Young takes a shot. Save by Richard Kingson. Corner taken by Ashley Young from the right by-line. Outswinging corner taken from the left by-line by Stewart Downing, Shot from 18 yards from Ashley Young. Inswinging corner taken by Ludovic Sylvestre from the left by-line played to the near post, Marlon Harewood produces a header from close range which goes wide of the left-hand upright. Nathan Delfouneso handles the ball and concedes a free kick. Chris Basham takes the free kick. Matt Phillips takes a shot. Save by Brad Friedel. Brett Ormerod is flagged offside by the assistant referee. Direct free kick taken by Brad Friedel. 45:00+2:38 The half-time whistle blows. 45:00+2:02 Ludovic Sylvestre takes the outswinging corner, clearance made by Nathan Delfouneso. 45:00+1:51 The ball is delivered by Matt Phillips, Richard Dunne manages to make a clearance. 45:00+1:43 The ball is delivered by Matt Phillips, Richard Dunne makes a clearance. 45:00+0:12 The assist for the goal came from Ludovic Sylvestre. 45:00+0:12 GOAL - Marlon Harewood:Aston Villa 1 - 1 Blackpool A goal is scored by Marlon Harewood from inside the penalty box to the bottom left corner of the goal. Aston Villa 1-1 Blackpool. 41:50 Richard Dunne concedes a free kick for a foul on Marlon Harewood. Direct free kick taken by David Carney. 41:01 David Carney concedes a free kick for a foul on Luke Young. James Collins takes the free kick. 38:30 Free kick awarded for a foul by Ciaran Clark on Brett Ormerod. Rob Edwards takes the direct free kick. 38:30 Booking Ciaran Clark goes into the book for unsporting behaviour. 37:35 Marc Albrighton produces a cross, blocked by Chris Basham. 36:58 The ball is delivered by Brett Ormerod, save made by Brad Friedel. 36:36 Marc Albrighton takes a shot. Jason Euell manages to make a clearance. 36:10 Jason Euell concedes a free kick for a foul on Ashley Young. Ashley Young takes the direct free kick. 31:52 Effort from deep inside the area by Luke Young misses to the right of the goal. 31:24 Stewart Downing decides to take a short corner. 30:11 James Collins fouled by Marlon Harewood, the ref awards a free kick. James Collins takes the free kick. 29:29 Centre by Marc Albrighton, save by Richard Kingson. 27:47 Assist on the goal came from Ashley Young. 27:47 GOAL - Stewart Downing:Aston Villa 1 - 0 Blackpool A goal is scored by Stewart Downing from outside the penalty area to the top right corner of the goal. Aston Villa 1-0 Blackpool. 26:51 Brett Ormerod is ruled offside. Free kick taken by Brad Friedel. 24:35 Foul by Ciaran Clark on Jason Euell, free kick awarded. Free kick taken by Jason Euell. Matt Phillips takes a shot. Richard Dunne gets a block in. David Carney takes a inswinging corner from the right by-line to the near post, clearance by Ciaran Clark. Corner taken by Ludovic Sylvestre played to the near post, clearance made by Nathan Delfouneso. 22:45 Dekel Keinan gives away a free kick for an unfair challenge on Nathan Delfouneso. Free kick taken by Stephen Warnock. 21:46 Luke Young produces a right-footed shot from close range that goes over the bar. 21:27 The ball is crossed by Marc Albrighton, Dekel Keinan manages to make a clearance. 18:40 James Collins gives away a free kick for an unfair challenge on Brett Ormerod. David Carney produces a strike on goal direct from the free kick. 17:43 Ashley Young is caught offside. Richard Kingson restarts play with the free kick. 15:57 The referee blows for offside against Brett Ormerod. Richard Dunne restarts play with the free kick. 14:20 Free kick awarded for an unfair challenge on Stephen Warnock by Brett Ormerod. Stephen Warnock takes the direct free kick. 13:33 Corner taken by Ashley Young from the right by-line, Ciaran Clark takes a shot. Comfortable save by Richard Kingson. 13:22 The ball is sent over by Marc Albrighton, Dekel Keinan makes a clearance. 12:18 Stewart Downing sends in a cross. 11:04 Marc Albrighton takes a shot. Save made by Richard Kingson. 10:33 Jason Euell is ruled offside. James Collins takes the indirect free kick. 8:41 Effort from the edge of the area by Matt Phillips goes wide of the left-hand post. 6:39 Effort on goal by Marlon Harewood from inside the penalty box misses to the right of the target. 6:05 Corner taken by Stewart Downing from the right by-line to the near post, clearance made by Keith Southern. 5:11 The ball is swung over by Keith Southern, Marlon Harewood takes a shot. Save made by Brad Friedel. Correction - 3:59 Unfair challenge on Luke Young by Ludovic Sylvestre results in a free kick. Brad Friedel takes the free kick. 3:59 Free kick awarded for an unfair challenge on Luke Young by Ludovic Sylvestre. Direct free kick taken by James Collins. 2:52 Foul by Dekel Keinan on Ciaran Clark, free kick awarded. Free kick taken by Stephen Warnock. 2:52 Booking Dekel Keinan goes into the book for unsporting behaviour. 1:11 Corner taken left-footed by David Carney, James Collins makes a clearance.